When it comes to buying edibles online (or anywhere, for that matter), the process can feel overwhelming, right?There’s simply so many brands and products with different flavors, textures, strengths, effects and reaction times to choose from. You might be wondering how you make any sense of it all. And when you do finally decide on a product, you’ll need to know how to get it, where to get it, and the appropriate price to pay for it. Don’t know where to start? 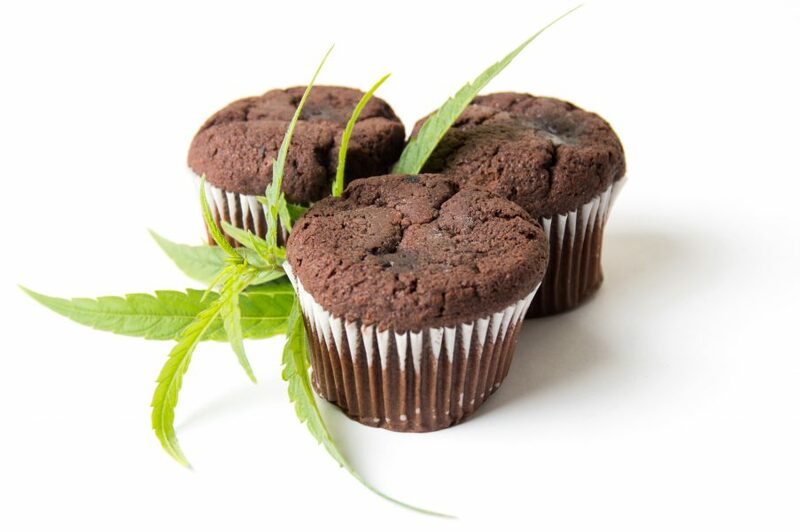 Don’t worry, because in this brief guide we’ll address these issues and more, so that you can make better purchase decisions when it comes to cannabis edibles. How Safe Is Buying Edibles Online? Where Can I Buy Edibles Online Legally? How Do I Know if an Online Retailer Is Legit? How Much Do Edibles Cost Online? What Are Some Recommended Edibles? The process of buying cannabis edibles online is pretty straightforward, especially since most dispensaries are cash-only businesses so there’s no fear of having your bank info stolen or having a recorded cannabis purchase. If you’re thinking of purchasing edibles from an online retailer that is not a legal cannabis dispensary, then that’s a whole other story which we’ll get to shortly. While no one has ever fatally overdosed from edibles (you’d need to consume thousands of times the amount of THC in one joint to be lethal) they can still be frightening to the amateur user and cause some unpleasant side effects like fear, panic, and confusion if you take too much or eat too many. Despite being relatively harmless, there’s no federal or even state-level quality control for edibles or any other cannabis products. Except if you live in a state like Colorado, where regulations are being implemented to ensure quality control, and product recalls have already happened. That means detailed info on all compounds present in an edible like THC, CBD, CBN, terpenes and even minor levels of contaminants must be provided, and all levels must conform to the American Herbal Pharmacopoeia monograph or the Department of Health’s standards. Whether cannabis brands are abiding by these standards seems unlikely since their enforcement remains to be put in place. 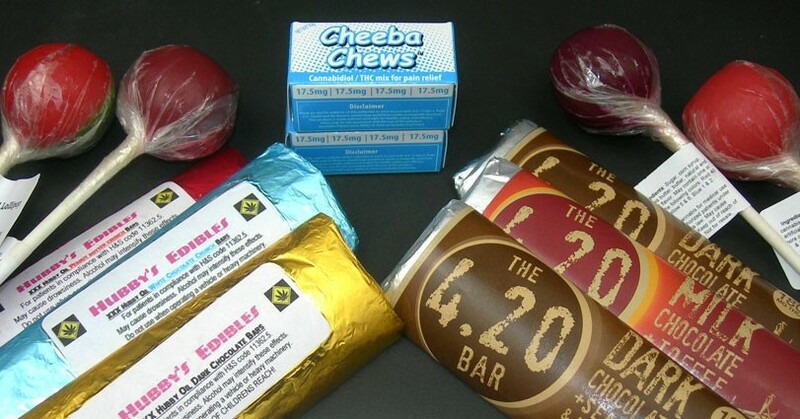 Prepackaged brand name edibles like Kiva, Bhang, Cheeba Chews, Korova, and Venice Cookie Company are typically the safest to consume since they include the product’s strength in milligrams, strain type(s), ingredients, THC:CBD ratio, and are reviewed and lab tested before sale. All you have to worry about is not consuming too much. Dispensary and homemade edibles usually have basic, loose packaging and less (if any) product info, so there are more unknown (but not necessarily dangerous) factors. Unless you have personal experience with the dispensary or with the person/people who make the homemade edibles, it may be best to steer clear of them. Pot brownies, THC candies, and other weed edibles can take anywhere from 30 to 120 minutes to work. Always consume edibles responsibly; start with a low dose (10mg or less) and wait at least 2-3 hours before taking another. Edibles are much more intense on an empty stomach so have a substantial meal before indulging. Label edibles and keep them in a separate area, hidden away from normal foods and snacks to avoid accidental consumption by children or anyone who might mistake them for a regular sweet treat. 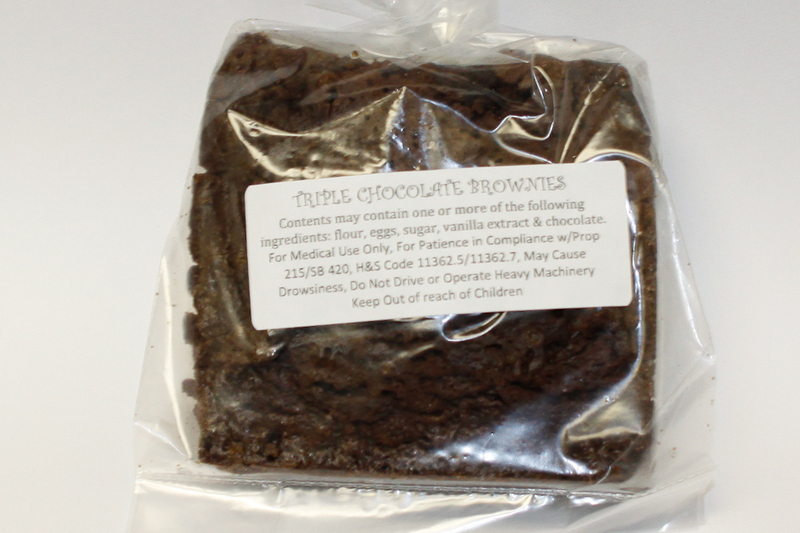 If you want to order marijuana edibles, you first must possess a valid California medical marijuana recommendation/card before purchasing edibles anywhere in the state, in-store or online. You don’t need to be a California resident to acquire one if you’re a U.S. resident, though it’s only valid here. Cards from other states won’t work. If you don’t have a doctor’s rec or card, you can get one in under 15 minutes and under $40 (if you qualify) using NuggMD. Ordering online from storefronts that deliver or from delivery-only dispensaries are the only legal way to buy THC edibles online (in California, at least). In other states with recreational or medical marijuana laws on the books, it’s likely that walking into a storefront location is your only legal option, as many states don’t yet have formal rules in place regarding cannabis delivery. Most dispensaries carry different brands and different kinds of edibles, to appeal to different types of customers and consumer preferences. Plus they often have giveaways, discounts, and other special promotions around their products. Variety’s the spice of life, so take advantage and enjoy being a sought after customer! Don’t purchase edibles outside of the state you live in. Neither dispensaries nor edible companies deliver or ship products outside of CA or whichever state they’re legally operating, so if you see a company advertising such a service, understand that they are doing so 100% illegally, and that you could find yourself in hot water if the law was to find out. Also, edible companies never (I should say only very very rarely, as the brand would need a collective license as well) sell directly to patients. 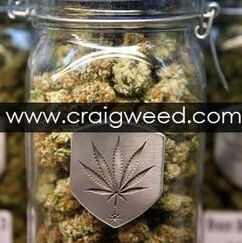 Instead, they distribute their products by selling wholesale to qualified storefront dispensaries and delivery services. Use your best judgment; if you’re still uncertain, do some background research. The images below depict a couple such illegal sites. While there will always be a black market for cannabis goods, these are sources you simply cannot trust. When you offer up your money to these sites, you’re quite literally taking a gamble on whether they do what they claim. Beware of online edible websites/companies like cannabisoilsale.net, orderediblesonline.com, helloganja.com & craigweed.com (which just links you to HelloGanja’s site). We strongly advise avoiding such illegal avenues at all costs, as not only could you end up high (or rather, not high) and dry with a hole in your wallet, but could face legal ramifications (and at the very least a huge headache in court) if cannabis products were found being delivered to your home via postal mail. Remember, delivery services might charge an extra fee, have an order minimum, and you might want to tip your driver, especially if you regularly use a certain collective. 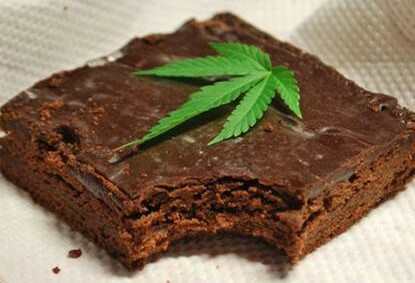 It’s not just pot brownies anymore! Every month there seems to be more and more edible brands pushing their infused products onto dispensary shelves. It’s actually quite overwhelming, and if you’re like most, you should just try a few until you hit on one (or multiple) that you like! 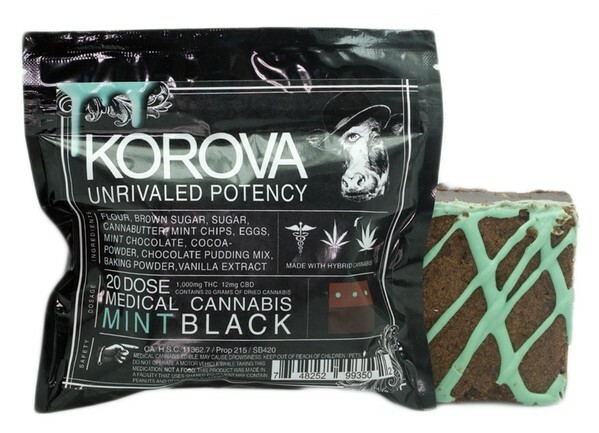 One of the most potent bars on the market, Korova’s Black Bar provides a whopping 1,000mg of THC in each brownie. Recommended for only those with extreme pain and/or tolerance, it contains 20 doses of hybrid herb. Now available in mint. 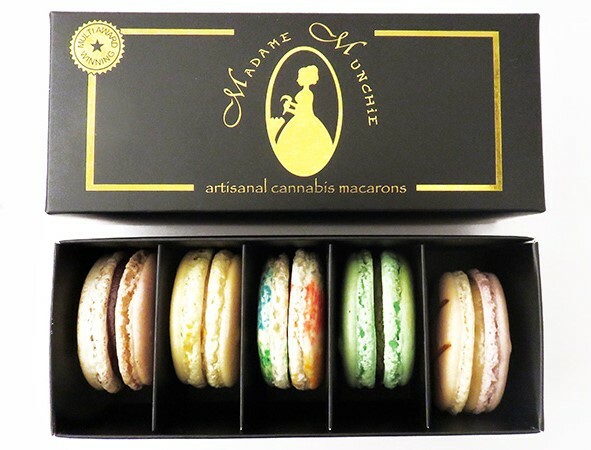 Madame Munchie’s artisanal cannabis macarons contain 20mg of THC in each blissful, beautiful confection and come in variety boxes of five or in single servings. Flavors include Citrus Almond, Green Gold, Hazelnut Mocha, PB&J and Tropical Jungle. 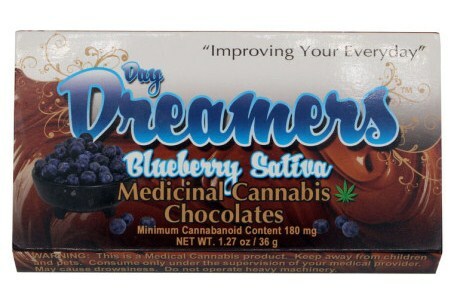 Day Dreamers is well known for their Chocolate Blueberry Sativa Bar that has six pre-portioned 30mg servings in each bar. You’ll be floating but functional (at just one of the doses, of course, not all six). Need a little kick in your tea or PB&J? 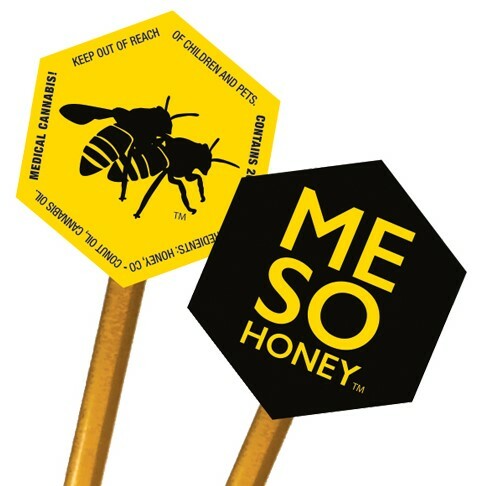 Add a VCC’s Me So Honey 20mg honey straw to any food or drink for a sweet cannabis concentrate-inspired buzz. 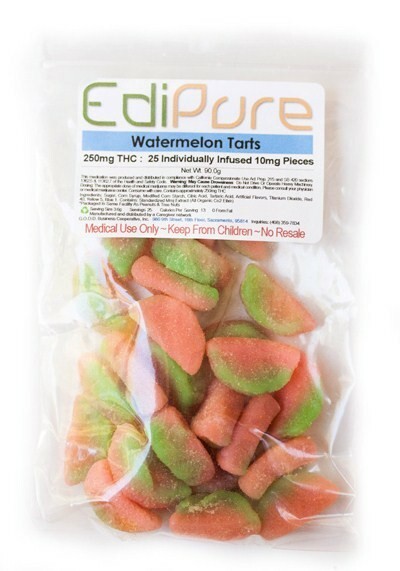 Edipure Watermelon Tarts are ideal for sour gummy enthusiasts. A 25-pack contains 250mg (10mg per gummy) of THC. 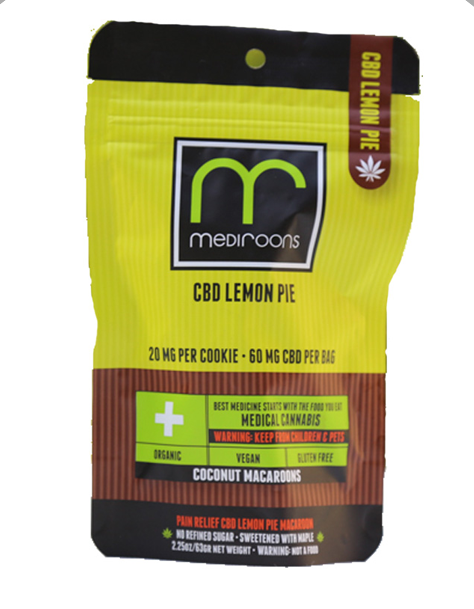 CBD MediRoons are a gluten-free, organic, vegan option that come in 20mg servings and contain no THC. Available in Chocolate Chip, Lemon Pie and Brownie. 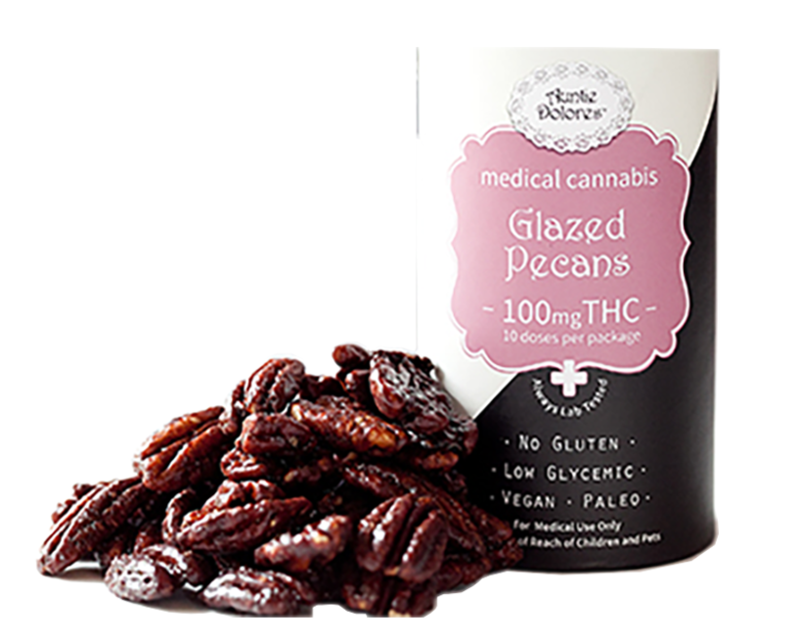 If you like to keep it healthy while enjoying your herb-infused edibles, try Auntie Dolores’ Glazed Pecans. Five to six pecans will yield a 10mg dose of THC (100mg per pack). Want to make your breakfast coffee or tea even stronger? 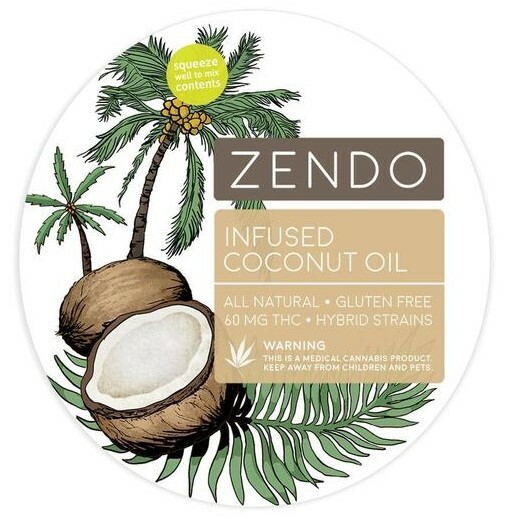 Pour a pouch of Zendo’s Infused Coconut Oil to add a some enlightenment to your morning. 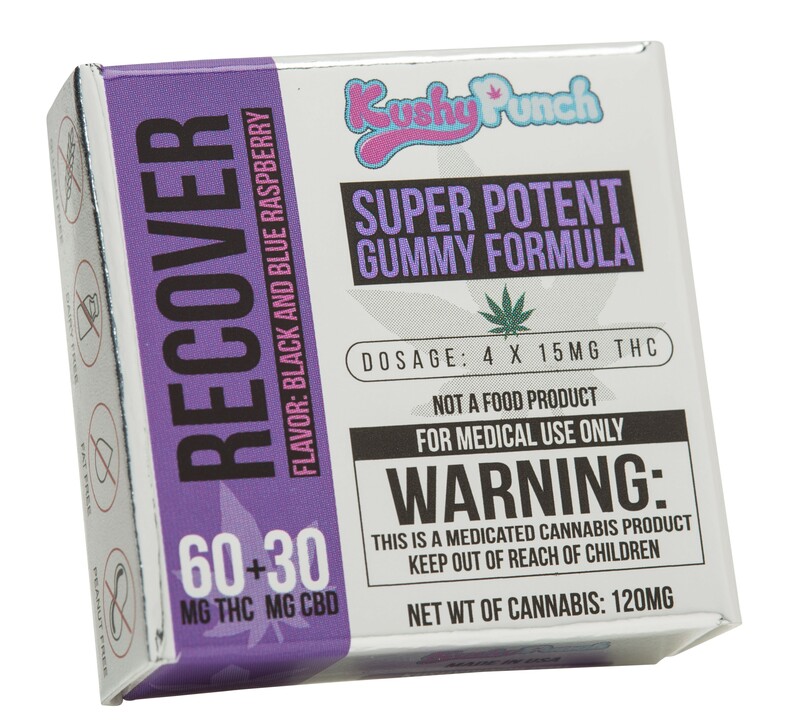 Kushy Punch offers a 4-pack of 15mg 2:1 THC:CBD “Recover” gummies, perfect for your Sunday hangover or gym soreness. Instead of taking chances with shady sites or spending time comparing edible prices, let Nugg do all the work for you in buying edibles online. Products get delivered to your home, quickly and conveniently within about an hour! 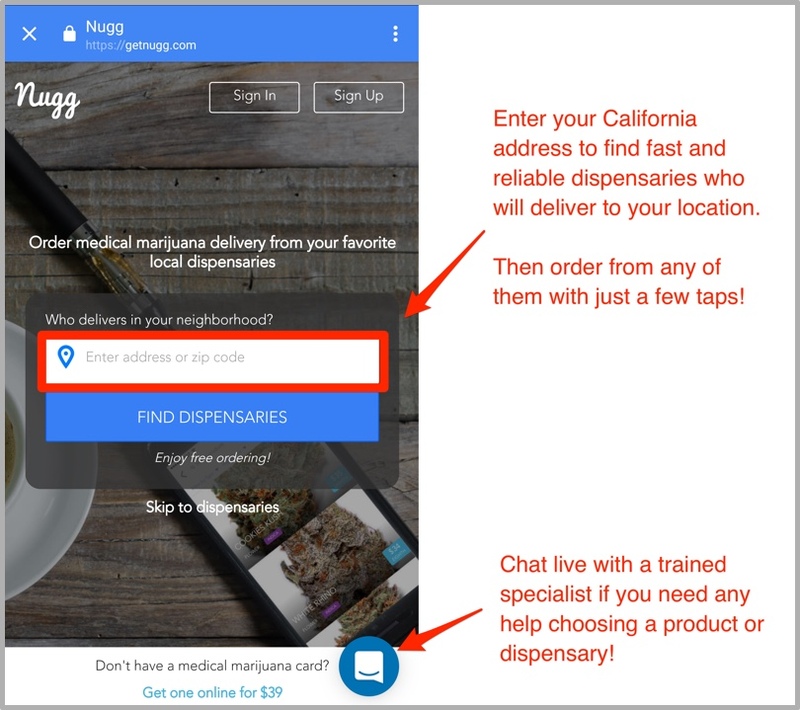 Just put in your zip code and a brief description of the marijuana edible you’re looking for (brand, strength, flavor) In seconds you’ll get a list of certified, local dispensaries and delivery services that have what you want at the price you’re willing to pay. Once you place an order online you’ll receive an ETA (about an hour). Now relax and wait for a courier to bring your edible cannabis straight to you. Additionally, if you don’t yet have your doctor’s recommendation in California (required for ordering medical cannabis products from legal dispensaries), use NuggMD to get a med card online in a matter of 15 minutes! Once you do, you’ll automatically get $20 off your first delivery order! “I would recommend to anyone buying edibles. No need to ask about products, just look them up online and purchase.” —Kristy N.
“It was about one hour from ‘please scan your recommendation so we can approve membership’ to a huge order of edibles at my doorstep. Great selection and very prompt.” —Von T.
“You can chat on their [the online service] web page, email up and back, whatever you need they are there and very personable. I have used them again and will continue to.” —Carl W.
“[Nugg] delivered to me in twenty minutes and they do all kinds of credits, cash-backs, and patient deals. They have great top shelf nugs…and a GREAT selection of edibles” —Lee V.
Nugg is the "GrubHub for marijuana." Our site lets medical marijuana patients order online from dispensaries that deliver to them. Signup with the code BLOG20 for a $20 credit on your first order! Good post on how to buy weed online. Very Good Post, This was helpful. If you need edibles just get them, they are good for the health. Juan. True, they are good for you, but you should know things like who’s selling them, who made them, where they’re from and if they’re lab tested and labeled before buying. Some people online can take advantage of sick patients and sell them inferior or just fake edibles. I used edible candy like Gummi bears and lolipops for med purposes. nice work here. Good articles. I will bookmark this. Thanks for this article. Its a good one. I’m looking for Indica edibles. Sativa gives me a headache.